The 5 or so minutes it takes to complete a scan is a fixed interval in the process of laser scanning fieldwork. The set up and tear down time of your rig between scans however is an area of your workflow that LSA can help streamline. Our customers have asked us how best to capture above ceiling scans and we are happy to announce a Streamlined Solution! Here at LSA, we understand that setting up and tearing down and setting back up a tripod with a valuable piece of technology attached between scans is a cumbersome and tediously time-consuming task. 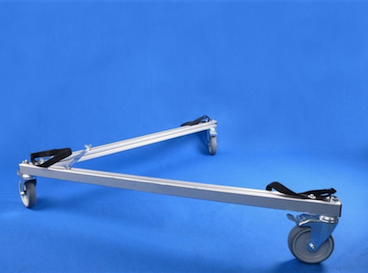 By combining a 2-way telescoping tripod and tripod dolly, LSA has developed the perfect solution for scans that require height and maneuverability through tight or awkward spaces. Our 2-way telescoping tripod provides your scans with a fantastic vertical range while a tripod dolly will glide your scanner effortlessly between scan locations. The dolly’s foldable legs allow you to navigate difficult spaces making it an ideal tool for indoor scans. 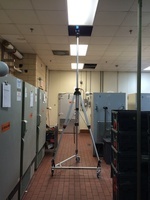 Our friend John Tocci (@Jtocci2) over at Gilbane Building Company took a hint from Tim on a recent above ceiling scan and has said that the maneuverability and height of his new tripod set up has streamlined his workflow. The obstacle of drop ceilings will never be a problem again with this combo. Get rolling on your next indoor scan job and see for yourself. 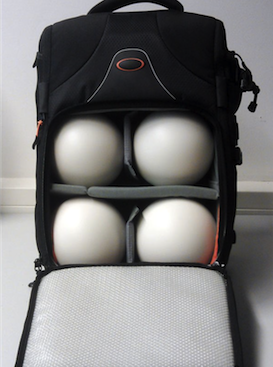 Add additional convenience and organization to your laser-scanning rig by purchasing a Laser Scanning Backpack with 6 flexi reference spheres and straps for a tripod and foldable dolly. Got any Streamlined Solutions of your own? Share them with us on Twitter @laserscan.